The filmmaker and artist Romeo Grünfelder (* 1968) MA in Music, Philosophy, Media and Visual Communication. He was a fellow of Villa Aurora in Pacific Palisades and in 2008 he received a art grant from the city of Hamburg. He teaches drama and philosophy at the College of Fine Arts in Hamburg. He lives and works in Hamburg. 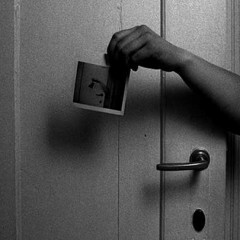 Grünfelder’s work was shown in exhibition context and at international film and media festivals. His awarded shortfilms are experimental documentaries in the broadest sense, oscillating between documentary and fine art. His main focus is on paranormal topics. Grünfelder’s work is represented by the Short Film Agency Hamburg, the Berlin gallery Kunstagenten as well as by the gallery Ruzicska-Weiss, Dusseldorf. Eyewitness to something that is not yet visible. A real premonition.